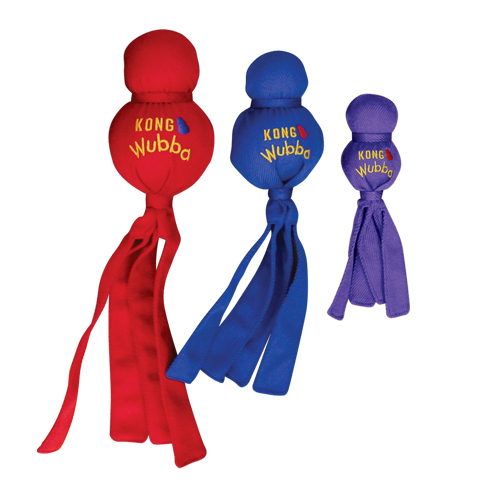 The KONG Wubba is a toy ball with a very strong nylon tail. Your dog will love playing with this ball! The KONG Wubba is very popular with dogs. Your dog will love to play with it and the big ball has a squeaker inside. Your dog can fetch the Wubba or you can play tug of war together. This squeaky toy is a must-have for your dog's collection! These colourful toys are made from ballistic nylon, a very strong type of nylon (7 times stronger than normal varieties!). It is available in three sizes: Small, Large and Extra Large. Sizes S, L and XL are available in purple, red and blue. Size S consists of two soft balls, the bottom one with a squeaker. Sizes L and XL have a soft ball with a squeaker and a hard ball on top. The four strips of fabric make the Wubba fun for your dog to play, run with, and shake. The strips make it easy to throw and also give your dog a good grip. Please note: Unfortunately you will not be able to select a colour, but receive one at random. Have you used KONG Wubba before? Let us know what you think about this product.